The traditional handscrew wood clamp is very flexible and can be a good jig, but there are several improvements I have always wanted to incorporate into it. Weight – there is no substitute for a high mass tool to secure an object. Provides rigidity and dampens vibration, as you work on a piece. 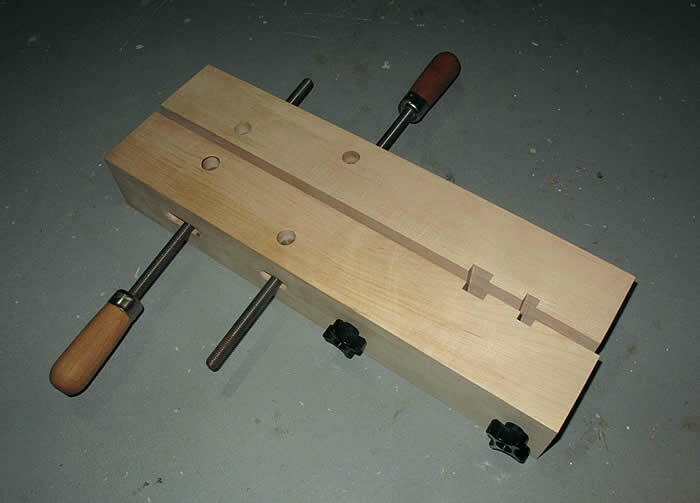 Square Jaw – The traditional bevel jaw works well when clamping wood for gluing pieces, but not as a jig, where you want to secure the assembly to another surface, such as a work-bench, drill-press, et cetera. Flat Space – More flat space to bind the object. Adaption – Notches to hold pieces or the ability to add another form-jig to secure complex shapes. To this end, I create, using a Lee Valley Jorgensen-Dubuque kit, I created the following woodscrew clamp, which has performed well for me. Using 3.5″ square hard maple, with a long extended jaw, I have a massive clamp-jig with a large mating surface. I have included 2 notches and there are 1/4″ centered holes through the jaw that allows be to secure another jig to the clamp if need be.